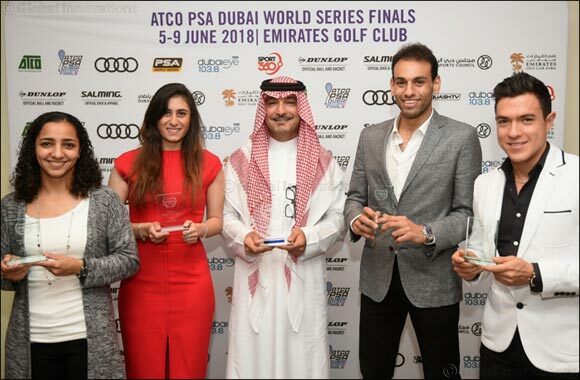 Dubai, UAE, June 5, 2018: Egyptian World No.1s Mohamed ElShorbagy and Nour El Sherbini were the big winners at the 2017/18 PSA Awards as they collected the Player of Year Awards in recognition of their exploits over the past season on the PSA World Tour during a gala dinner held at the Westin Dubai Mina Seyahi Beach Resort & Marina last night. On the eve of the season-ending ATCO PSA Dubai World Series Finals, ElShorbagy, who begins the defence of his title today (June 5) against Colombian Miguel Angel Rodriguez, was presented with the men's trophy following an emphatic return to the top of the game that saw him win seven major titles, including the 2017 PSA World Championships crown, during the campaign. ElShorbagy narrowly edged Rodriguez – the man who beat him in the final of the recent Allam British Open – to the accolade which was chosen by the PSA Awards Committee, a group consisting of selected influential former players, members of the media, tournament promoters and PSA Board representatives combined with the results of a social media vote. El Sherbini meanwhile was honoured with the women’s award after a season that saw her claim four PSA World Series titles - the Hong Kong Open, inaugural Saudi PSA Women’s Squash Masters, Tournament of Champions and British Open - as one of only two players, alongside compatriot Nour El Tayeb, to collect multiple World Series title this season. New Zealand’s Joelle King, who returned to the top of the women’s game four years after a career-threatening injury, was runner-up. Egyptian Women’s World Champion Raneem El Welily collected the Female Spirit of Squash Award. Chosen by her fellow players, the prize goes to the player who best demonstrated sportsmanship throughout the season both on and off court - while Rodriguez collected the men’s award. Rodriguez also picked up the Men’s Shot of the Season Award, with El Tayeb taking the women’s award. El Tayeb was also one half of the Women’s Match of the Season combination alongside King - with fans voting for their epic title decider at the Windy City Open. The Men’s Match of the Season was German Raphael Kandra’s win over Marwan ElShorbagy in their epic British Open quarter-final encounter. Rising Malaysian talent Sivasangari Subramaniam was named Women's Young Player of the Year following a season that saw her impress in front of the SQUASHTV cameras at the Open International de Squash de Nantes and the El Gouna International - during a season that also saw her reach the world’s top 40. Peruvian Diego Elias, the former World Junior Champion, was named Men's Young Player of the Year for the second year running. The final prize of the evening went to PSA Chairman Ziad Al-Turki, who was presented with the PSA Services to Squash Award by the PSA Foundation in recognition of his contribution to the sport during the past twelve months. The year saw Al-Turki mastermind the staging of the Saudi PSA Masters, bringing professional women’s sport to Saudi Arabia for the first time in history and creating a legacy in the country to help promote women’s sport to a wider audience, while he also secured the staging of the ATCO PSA Dubai World Series finals for the third consecutive year in Dubai. Action kicks off in the ATCO PSA Dubai World Series Finals at the Emirates Golf Club today. Group stage matches will take place at 3:00pm, 3:45pm, 4:30pm and 5:15pm (Group B) and 8:00pm, 8:45pm, 9:30pm and 10:15pm (Group A) between June 5-7 with the semi-finals due to take place from 8:00pm on June 8. The finals will commence at 8:00pm local time on June 9.